Test your limits with these invigorating sessions. If you're new to ashtanga, prepare for culture shock: The names of poses, which are done according to the traditional "primary sequence," are given only in Sanskrit—and there will be asanas you've never seen. The vinyasas are intense; there's one between each seated pose, and it starts with hoisting your body up between your hands and shooting your legs back to chaturanga. (Or stumbling through it, again and again.) At times, it's difficult to see whether ashtanga is harder on the arms or the ego, because there's not much to distract you from the pain—instructor Elise Espat wants students to focus inward, so she simply counts breaths in each pose. 112 North 6th St between Berry St and Wythe Ave, Williamsburg, Brooklyn (718-486-5602, goyoga.ws). Tue, Thu 3:30--5pm; drop-in $18, students $10, five classes $85, ten classes $160, 20 classes $280, one-month unlimited $129; with student ID: drop-in $10, one-month unlimited $89; first-time participant: three classes $30. This vinyasa class opens with lots of chanting, occasionally accompanied by harmonium, and progresses to creative flowing sequences that include a satisfying mix of challenging arm balancing and restful seated poses. The pace is steady but moderate, and the hard work followed by long stretches will leave you feeling refreshed rather than drained. 135 W 20th St between Sixth and Seventh Aves, sixth floor (212-675-4555, yogamayanewyork.com). 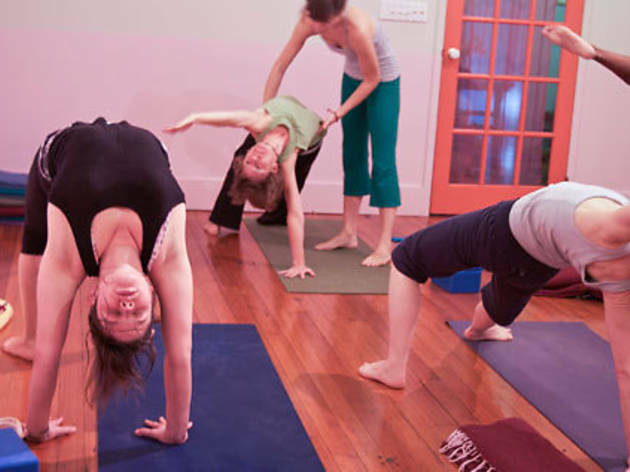 Sat, Sun 4--5:45pm; drop-in $18, ten classes $150, monthly unlimited $140. Atmananda teaches a sequence that combines hatha, iyengar and ashtanga traditions; each new level, from one to seven, adds a batch of harder poses. 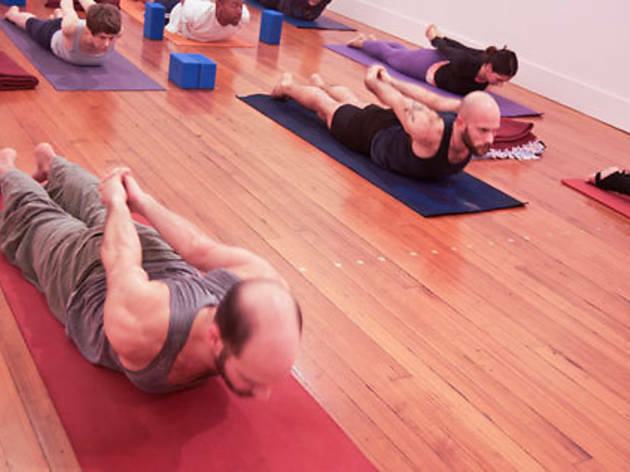 Nevertheless, the session felt simple because the instructor offered variations and provided instructions in a calm, soothing voice that made every asana feel like a meditation—even as you're being directed to throw your legs over your head in peacock, or attempting the grueling transition from headstand to forearm stand. 67 Irving Pl between 18th and 19th Sts, second floor (212-625-1511, atmananda.com). Thu 6:30--7:55pm; drop-in $10, 10 classes $80, one-month unlimited $99, annual unlimited $75 per month. Studio cofounder Isaac Pea's crowded morning vinyasa class begins with simple, joint-loosening movements, but quickly builds to a tough, sweaty practice. Complicated poses are often repeated, giving students a chance to find a deeper stretch each time. Most of Pea's followers use their bodies for a living—yoga teachers, dancers, even circus performers—and looking around the studio proves his students prowess, as they slip easily into extreme back bends or inversions. But the class doesn't exclude more casual practitioners, who may find they can push their bodies to do more than they expected. 254 Fifth Ave between 28th and 29th Sts, third floor (212-532-2033, sankalpah.com). Tue 9:30--11am; drop-in $18, five classes $80, ten classes $150, 20 classes $280, 30 classes $390, one-month unlimited $175, three-month unlimited $450. Instructor Halle Becker's sarcastic banter is witty enough to make her students smile while crouched in the famously miserable chair pose. The workout for this popular hot power-vinyasa class, in which breathing is synchronized with movement, includes push-ups, crunches and instructions like "power up that pose!" The vigorous hour culminated in 40 people belting out the chorus to "Play That Funky Music." 206 E 63rd St between Second and Third Aves (212-486-4111, earthyoganyc.com). Mon 6:15--7:30pm; drop-in $25. Laughing Lotus champions positivity: Its teachers are enthusiastic and animated, the studio is decorated in yellows and pinks, and in addition to posing, chanting and breathing, laughter is par for the course. 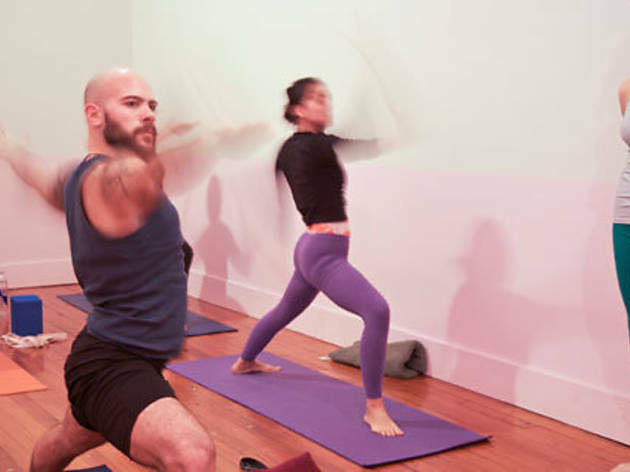 At Midnight Yoga class, you'll see the giddy ethos in action: Luke Simon and Anastasia Nevin teach a flowing, two-hour open-level class that's accompanied by live musicians who respond beautifully to the nuances of each sequence. You need to be fit for sure, and you will sweat—but you'll emerge feeling wide awake, serene and ready to face the weekend. 59 W 19th St at Sixth Ave, third floor (212-414-2903, laughinglotus.com). Fri 10pm--midnight; single class $16, packages available. Greenhouse has three studios in Williamsburg and a loyal following—and it's easy to see why when you take dynamic, devotional classes like this one. The intermediate Sweat and Flow absolutely delivers on its promise: After some chanting and a gentle warm-up, Amanda Capobianco leads a packed class through an energetic, flowing asana sequence—moving quickly but gracefully from pose to pose. Bonus: The class is accompanied by excellent music (everything from obscure rural chanting to the Black Keys). 783 Driggs Ave at South 4th St, Williamsburg, Brooklyn (718-384-9454, greenhouseholistic.com). Fridays 6:30--8pm; single class $15, packages available. This is an intense class, certainly, but there are no bells and whistles: Pioneered by B.K.S. Iyengar in the '60s, Iyengar yoga focuses on perfect alignment, not fancy twists or high-energy sequences. Taking this class may change the way you practice—and you'll certainly be surprised by how challenging the most basic poses can be when done properly. Adam Vitolo is a dream teacher of the technique: He's friendly and patient, and there's no wishy-washy philosophizing, just the strict fundamentals. This one is great for vinyasa practitioners wishing to improve their alignment, and a good introduction for sporty types wary of extensive chanting. 204 W 77th St at Amsterdam Ave (212-877-2025, pureyoga.com). Wed 5:30--7pm; monthly membership $145. With its rose-pink walls, beautiful big windows and serene statues of deities. 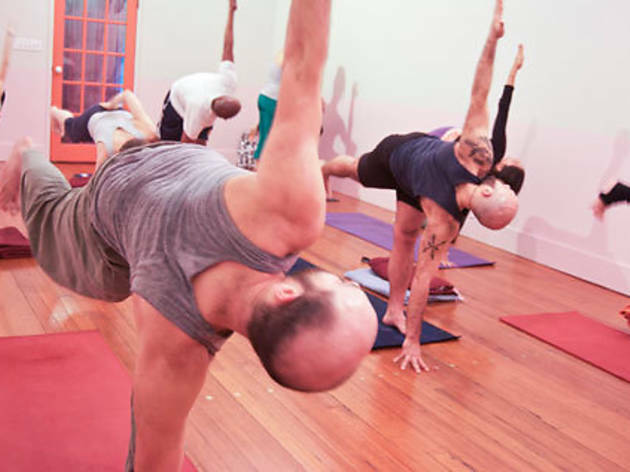 Shala is a refreshing place to practice, compared with the sterile, boutique-style studios found elsewhere in Manhattan. The same can be said of its teachers, who eschew intense gym values ("Work your core!") in favor of mindful stretching. Julianna Takacs leads this class for intermediate-advanced yogis with poise and humor: You begin with a brief, insightful lecture about incorporating yogic principles into your everday life (known as a dharma talk), followed by harmonium-accompanied chanting and a breath-led sequence of advanced poses that will be familiar to experienced practitioners. Takacs integrates core spiritual values with challenging, strength-building poses to inspiring effect. 815 Broadway at 12th St, second floor (212-979-9988, theshala.com). Sat 4:30--6pm; single class $19, packages available. If you're at all interested in the more spiritual aspects of yoga, any amount of time spent around Ruth Lauer-Manenti—whose nickname, Lady Ruth, was given to her by Buddhist master Geshe Michael Roach—can be mind-blowing. Lauer-Manenti opens with the kind of concise dharma talk that may stay with you the whole week, and she teaches with an almost disarming serenity. Which is not to say the class isn't tough. 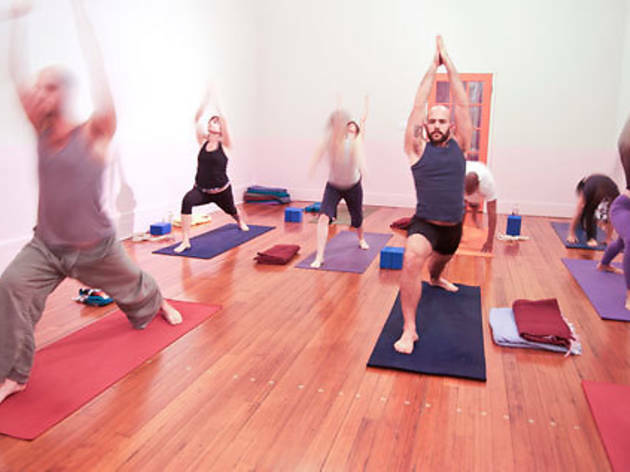 Jivamukti yoga features a vinyasa-sequenced flow, and you'll hold most poses for five deep breaths. Fans of the practice include Gwyneth Paltrow, Sting and Russell Simmons. But don't go for the celebs—go for Lady Ruth. 841 Broadway between 13th and 14th Sts, second floor (212-353-0214, jivamuktiyoga.com). Mon 10am, 6:15pm; Sun 10am, 2:30pm; single class $20, packages available.